Yesterday at Lake Merritt. Right after I publicly bemoaned the lack of rain, it rained lightly during the night and on and off today. Although much appreciated, we have a very long way to go before we reach our seasonal average. For more reflections, visit James' meme Weekend Reflections. 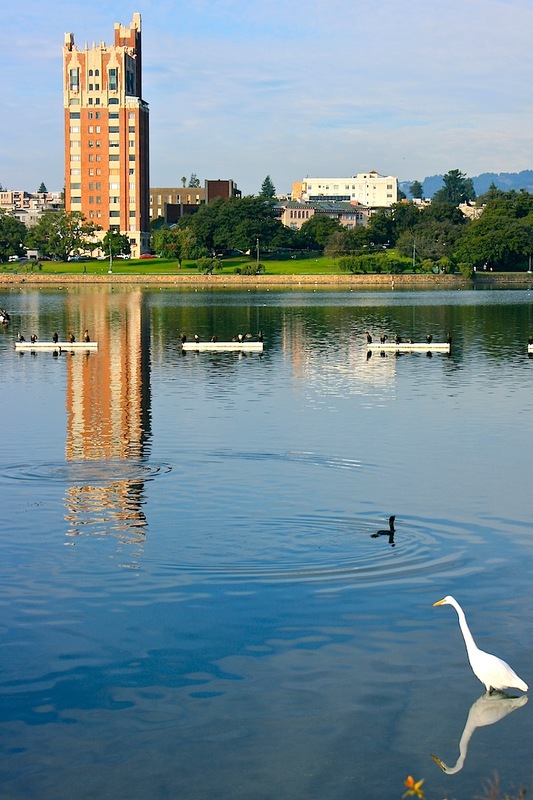 Lake Merritt at dusk with the Federal Building in the background. The Necklace of Lights is beginning to glow along the lake front. A close inspection reveals there's more than a 100 birds in this shot. Still no rain, which is not a good sign. For more sky views from around the globe, visit Skywatch Friday. Xyclo is a local Vietnamese restaurant named after the pedaled rickshaw of VietNam. It's a popular place that features an innovative menu. This picture was taken during the annual Halloween parade and trick o' treat fest on Piedmont Avenue. For more takes on "X" visit ABC Wednesday. This graceful sculpture sits atop the Charles Crocker tomb in Mt. View Cemetery. It has previously been featured here. The Crocker name, well known in California, is associated with banking and railroads. Mt. View Cemetery, established in 1863 and designed by Frederick Law Olmsted, was developed as an ecumenical site that welcomed all races and religions. It also embodied the Transcendentalist philosophy of man as being of nature rather than being separate from it. 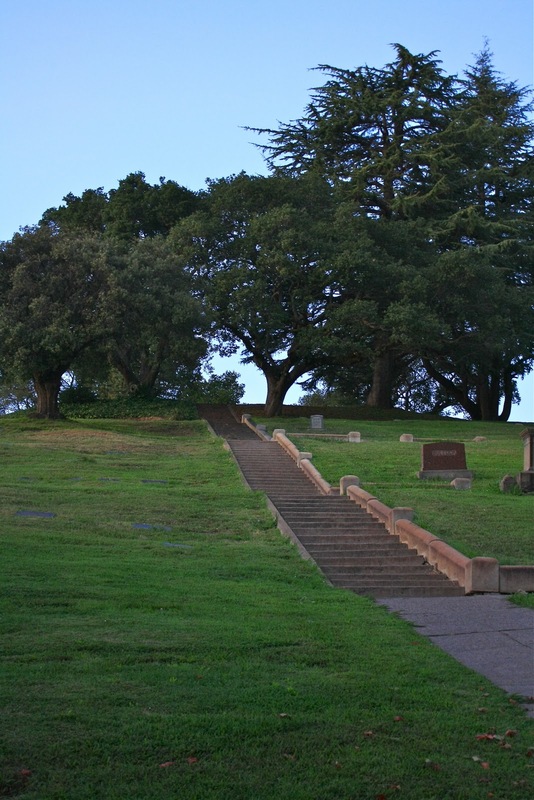 The cemetery was intended to be a natural park and to serve as more than a burial ground. Today it is very much occupied by the living as well as the dead. People come to exercise, walk their dogs, attend concerts and holiday celebrations, bird watch, picnic and honor their family members who have gone before. You frequently hear bagpipes playing as part of funeral ceremonies. 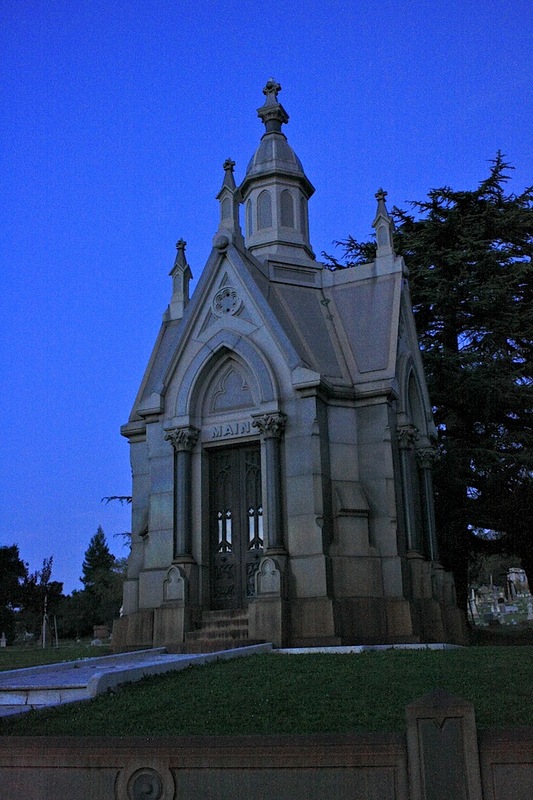 This cemetery has been featured many times in this blog, which makes Julie's new meme a perfect fit. 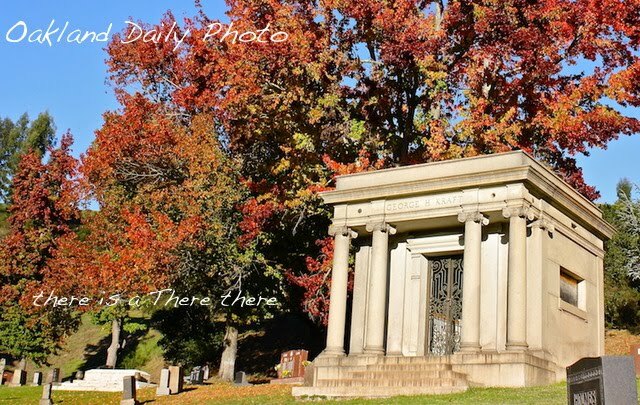 She has just launched Taphophile Tragics to showcase the historical and artistic aspects of cemeteries that make them fascinating to so many of us. Stop by to see what's on display. Early in November I showed you this mural in progress by Thomas Christopher Haag. It was recently finished and fairly glows in its space. He's wrapped the mural around to the front corner of the building as well. It's hard not to like it, especially his presentation of magical animals. More murals can be found here, here, and here. Much to my surprise, this is my 501st post. This is the entry gate to Mt. View Cemetery. I was pleased that this night photo picked up the the gilt that adorns the gate. And the silhouettes on the ground. For more takes on "W" visit Mrs. Nesbitt's meme, ABC Wednesday. We're close to starting a new round; think about joining us. The sun had set when I snapped this. It wasn't until later that I saw the far cluster of headstones that seemed to be glowing. The St. Vincent de Paul Community Center has recently added murals painted by local clients based on the 23rd Psalm. The artistry is naïf but heartfelt. Go here, here, and here for more murals. We're back to a dry spell with chilly weather. At the Middle Shoreline Park in West Oakland, the waters were calm and the low sun cast a golden light. For more reflections, visit James' meme Weekend Reflections. It's been gray and raining. But the sight of these chairs seemed to lift the gloom. A bonus is the deco era tiles on the facade. Verklempt is a wonderful Yiddish word meaning "choked up with emotion." That's what I thought this chicken might be feeling knowing he's soon to be dinner. Caught this in the window of Maison d'Etre on College Avenue. It made me laugh. For more takes on "V" visit the variety of contributions to ABC Wednesday. Today is the feast day of La Virgin de Guadalupe, an icon so important to Mexican culture. 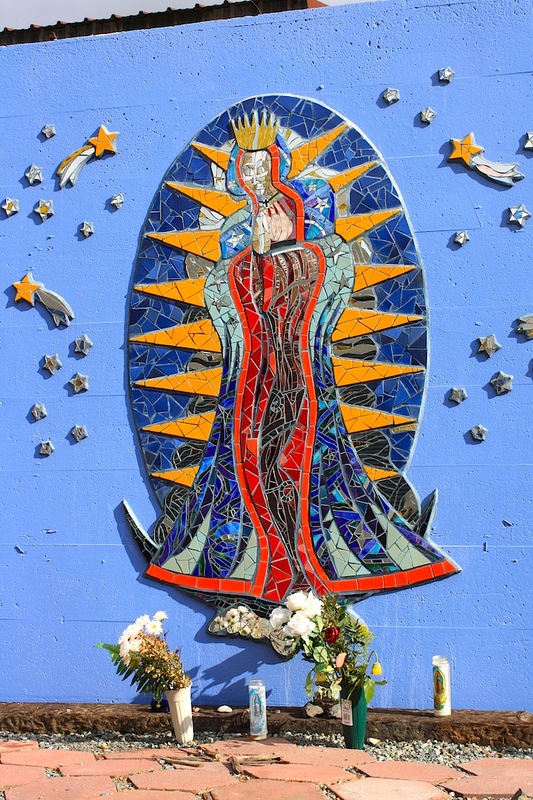 This mural was done with glass mosaic tesserae, possibly under the guidance of the nearby Institute of Mosaic Art, on a mural wall in Jingletown. Check out links to other murals posted today here, here, and here. 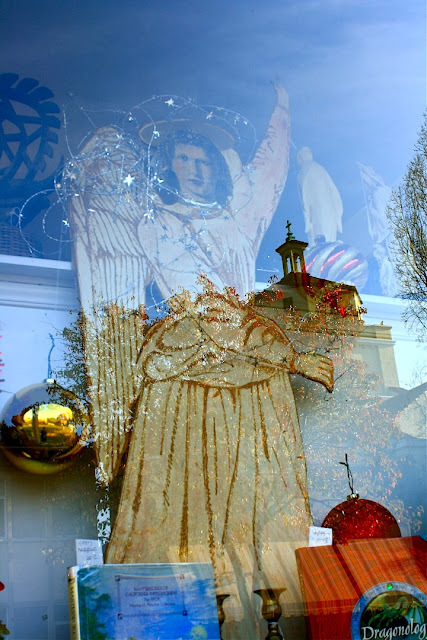 I really like the tall angel in local bookstore Black Swan's window. And then noticed the reflection of St. Leo's Church across the street. Seemed like a good match. For more reflection photos, visit Weekend Reflections. This is the view you get once you climb the stairway featured yesterday. The skies have been clear and the weather chilly. For more sky views from around the world, visit Skywatch Friday. Walk up these stairs; catch your breath; walk along the upper path; veer to the right. Voila! A fantastic view of the bay. Catch your breath again. For more takes on "U" be sure and visit ABC Wednesday. Spotted this mural while driving down 7th Street in West Oakland yesterday. It is on the wall of Bikes4Life a community business that works with youth. After two days of intense wind, the weather has turned mild. The clear air and late afternoon sun make everything sparkle. Including the cranes at Shoreline Park in West Oakland. For more scenes straight out of the camera, visit SOOC. Rare Bird on Piedmont Avenue has this arresting window display. 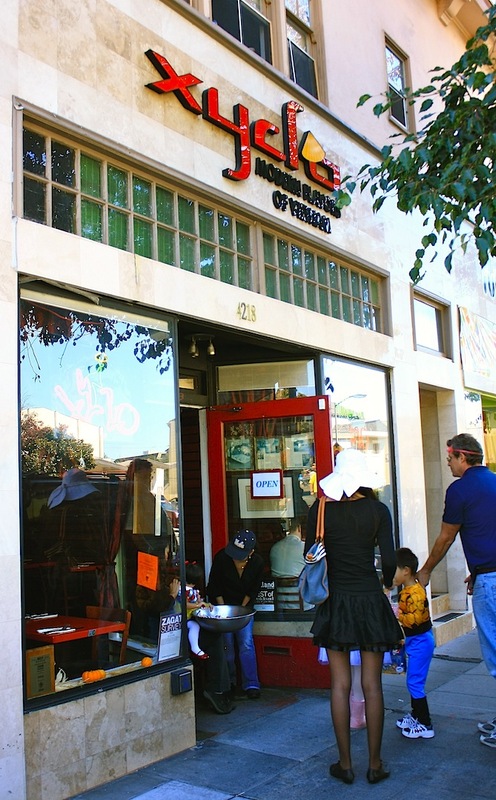 The shop's owner organizes the 3rd Thursday Art Walk on the Avenue. This shop was previously featured as part of Monday Mural. For more Weekend Reflections, please visit James' meme. They feel like they're flying. Seen at The Temescal Street Fair this past summer. 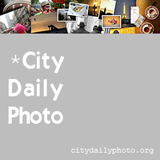 Click here to view thumbnails for all participants in this month's CDP Theme Day.